The AWS Console mobile app, provided by Amazon Web Services, allows its users to view resources for select services and also supports a limited set of management functions for select resource types. Following are the various services and supported functions that can be accessed using the mobile app. Browse, filter and search instances. Check status of CloudWatch metrics and alarms. Perform operations over instances like start, stop, reboot, termination. Browse, filter and search load balancers. View configuration details of attached instances. Add and remove instances from load balancers. Browse buckets and view their properties. Browse and view hosted zones. Browse and view details of record sets. Browse, filter, search and reboot instances. View configuration details, security and network settings. View group details, policies, metrics and alarms. Manage the number of instances as per the situation. View environment configuration and swap environment CNAMEs. View tables and their details like metrics, index, alarms, etc. View stack status, tags, parameters, output, events, and resources. View configuration details of stack, layers, instances and applications. View instances, its logs, and reboot them. View CloudWatch graphs of resources. List CloudWatch alarms by status and time. Provides information of available services and their status. All information related to the billing of the user. Switch the users to see the resources in multiple accounts. To have access to the AWS Mobile App, we must have an existing AWS account. Simply create an identity using the account credentials and select the region in the menu. This app allows us to stay signed in to multiple identities at the same time. For security reasons, it is recommended to secure the device with a passcode and to use an IAM user's credentials to log in to the app. In case the device is lost, then the IAM user can be deactivated to prevent unauthorized access. Root accounts cannot be deactivated via mobile console. 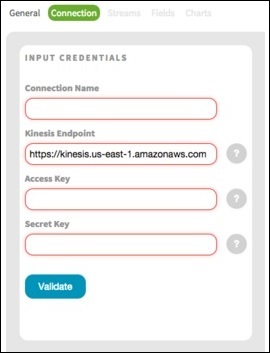 While using AWS Multi-Factor Authentication (MFA), it is recommended to use either a hardware MFA device or a virtual MFA on a separate mobile device for account security reasons. The latest version is 1.14. There is a feedback link in the App's menu to share our experiences and for any queries. How to Use AWS Account? Create your password and access your account credentials. Activate your services in credits section. Step 1 − To create an AWS account, open this link https://aws.amazon.com and sign-up for new account and enter the required details. If we already have an account, then we can sign-in using the existing AWS password. 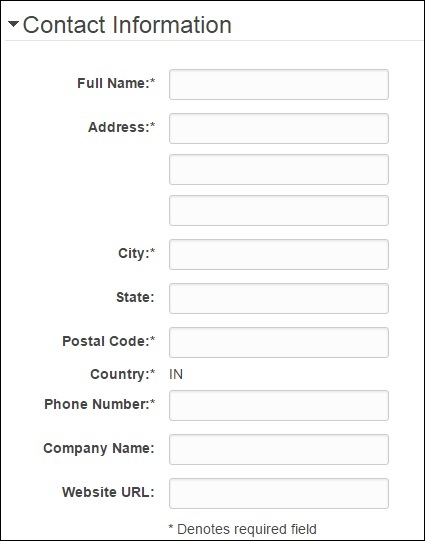 Step 2 − After providing an email-address, complete this form. Amazon uses this information for billing, invoicing and identifying the account. After creating the account, sign-up for the services needed. Step 3 − To sign-up for the services, enter the payment information. Amazon executes a minimal amount transaction against the card on the file to check that it is valid. This charge varies with the region. Step 4 − Next, is the identity verification. Amazon does a call back to verify the provided contact number. Step 5 − Choose a support plan. Subscribe to one of the plans like Basic, Developer, Business, or Enterprise. The basic plan costs nothing and has limited resources, which is good to get familiar with AWS. Step 6 − The final step is confirmation. Click the link to login again and it redirects to AWS management console. Now the account is created and can be used to avail AWS services. AWS assigns two unique IDs to each AWS account. It is a 12-digit number like 123456789000 and is used to construct Amazon Resource Names (ARN). This ID helps to distinguish our resources from resources in other AWS accounts. 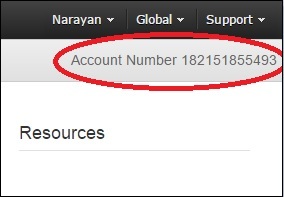 To know the AWS account number, click Support on the upper right side of the navigation bar in AWS management console as shown in the following screenshot. It is a long string of alphanumeric characters like 1234abcdef1234. 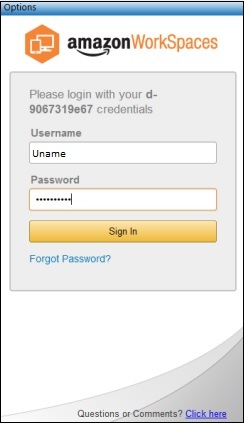 This ID is used in Amazon S3 bucket policy for cross-account access, i.e. to access resources in another AWS account. Account alias is the URL for your sign-in page and contains the account ID by default. We can customize this URL with the company name and even overwrite the previous one. How to Create/Delete Your Own AWS Account Alias? Step 2 − Select the customize link and create an alias of choice. Step 3 − To delete the alias, click the customize link, then click the Yes, Delete button. This deletes the alias and it reverts to the Account ID. Multi Factor Authentication (MFA) provides additional security by authenticating the users to enter a unique authentication code from an approved authentication device or SMS text message when they access AWS websites or services. If the MFA code is correct, then only the user can access AWS services or else not. 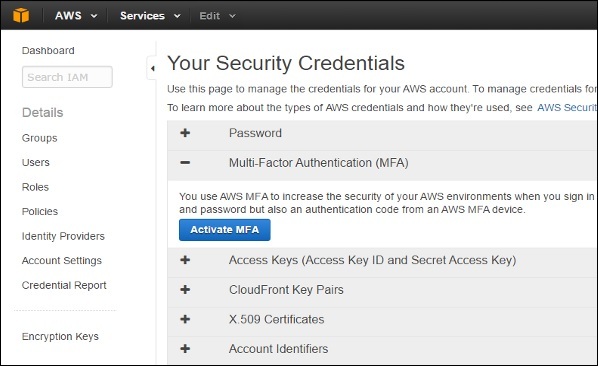 To use MFA services, the user has to assign a device (hardware or virtual) to IAM user or AWS root account. Each MFA device assigned to the user must be unique, i.e. the user cannot enter a code from another user's device to authenticate. How to Enable MFA Device? Step 2 − On the web page, choose users from the navigation pane on the right side to view the list of user name. Step 3 − Scroll down to security credentials and choose MFA. Click activate MFA. Step 4 − Follow the instructions and the MFA device will get activated with the account. In this method, MFA requires us to configure the IAM user with the phone number of the user's SMS-compatible mobile device. When the user signs in, AWS sends a six-digit code by SMS text message to the user's mobile device. The user is required to enter the same code on a second web page during sign-in to authenticate the right user. This SMS-based MFA cannot be used with AWS root account. In this method, MFA requires us to assign an MFA device (hardware) to the IAM user or the AWS root account. The device generates a six-digit numeric code based upon a time synchronized one-time password algorithm. The user has to enter the same code from the device on a second web page during sign-in to authenticate the right user. In this method, MFA requires us to assign an MFA device (virtual) to the IAM user or the AWS root account. A virtual device is a software application (mobile app) running on a mobile device that emulates a physical device. The device generates a six-digit numeric code based upon a time-synchronized one-time password algorithm. The user has to enter the same code from the device on a second web page during sign-in to authenticate the right user. IAM is a user entity which we create in AWS to represent a person that uses it with limited access to resources. Hence, we do not have to use the root account in our day-to-day activities as the root account has unrestricted access to our AWS resources. How to Create Users in IAM? 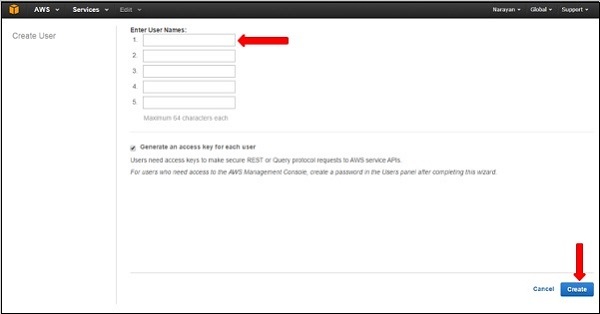 Step 1 − Open the link https://console.aws.amazon.com/iam/ to sign-in to AWS Management console. Step 2 − Select the Users option on the left navigation pane to open the list of all users. Step 3 − We can also create New Users using the Create New Users option, a new window will open. Enter the user-name which we want to create. Select the create option and a new user will be created. 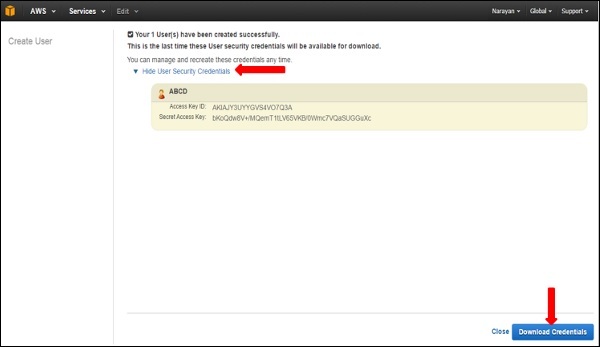 Step 4 − We can also see Access Key IDs and secret keys by selecting Show Users Security Credentials link. We can also save these details on the computer using the Download Credentials option. Step 5 − We can manage the user’s own security credentials like creating password, managing MFA devices, managing security certificates, creating/deleting access keys, adding user to groups, etc. There are many more features that are optional and are available on the web page. Amazon EC2 (Elastic Compute Cloud) is a web service interface that provides resizable compute capacity in the AWS cloud. It is designed for developers to have complete control over web-scaling and computing resources. EC2 instances can be resized and the number of instances scaled up or down as per our requirement. These instances can be launched in one or more geographical locations or regions, and Availability Zones (AZs). Each region comprises of several AZs at distinct locations, connected by low latency networks in the same region. In AWS EC2, the users must be aware about the EC2 components, their operating systems support, security measures, pricing structures, etc. Amazon EC2 supports multiple OS in which we need to pay additional licensing fees like: Red Hat Enterprise, SUSE Enterprise and Oracle Enterprise Linux, UNIX, Windows Server, etc. These OS needs to be implemented in conjunction with Amazon Virtual Private Cloud (VPC). Users have complete control over the visibility of their AWS account. In AWS EC2, the security systems allow create groups and place running instances into it as per the requirement. You can specify the groups with which other groups may communicate, as well as the groups with which IP subnets on the Internet may talk. AWS offers a variety of pricing options, depending on the type of resources, types of applications and database. It allows the users to configure their resources and compute the charges accordingly. Amazon EC2 allows the users to access its resources to design fault-tolerant applications. EC2 also comprises geographic regions and isolated locations known as availability zones for fault tolerance and stability. It doesn’t share the exact locations of regional data centers for security reasons. 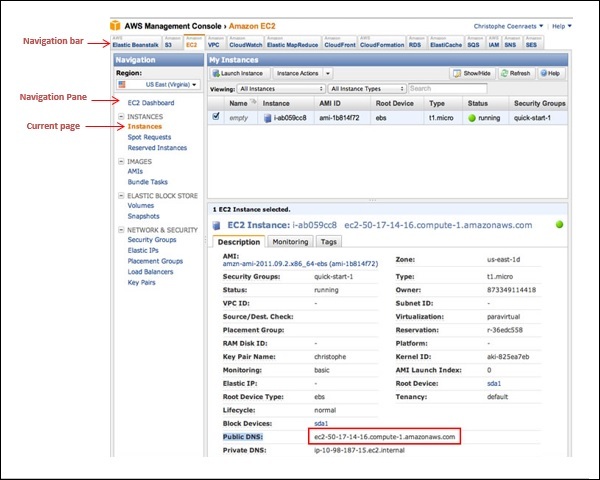 When the users launch an instance, they must select an AMI that's in the same region where the instance will run. Instances are distributed across multiple availability zones to provide continuous services in failures, and Elastic IP (EIPs) addresses are used to quickly map failed instance addresses to concurrent running instances in other zones to avoid delay in services. 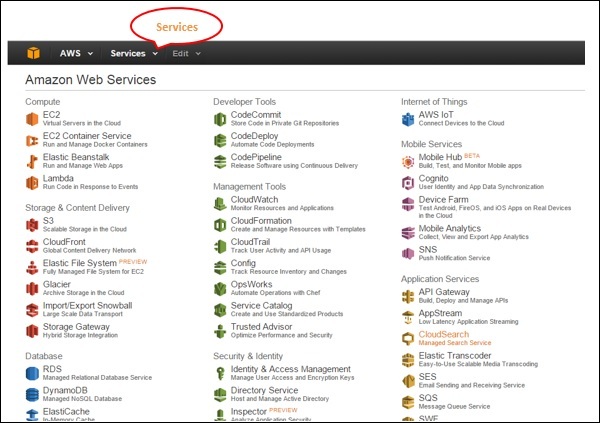 This service allows the users to move existing applications into EC2. It costs $80.00 per storage device and $2.49 per hour for data loading. This service suits those users having large amount of data to move. Reliable − Amazon EC2 offers a highly reliable environment where replacement of instances is rapidly possible. Service Level Agreement commitment is 99.9% availability for each Amazon EC2 region. Designed for Amazon Web Services − Amazon EC2 works fine with Amazon services like Amazon S3, Amazon RDS, Amazon DynamoDB, and Amazon SQS. It provides a complete solution for computing, query processing, and storage across a wide range of applications. Secure − Amazon EC2 works in Amazon Virtual Private Cloud to provide a secure and robust network to resources. Flexible Tools − Amazon EC2 provides the tools for developers and system administrators to build failure applications and isolate themselves from common failure situations. 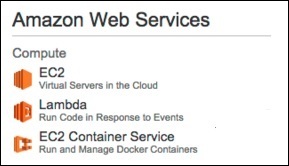 Inexpensive − Amazon EC2 wants us to pay only for the resources that we use. It includes multiple purchase plans such as On-Demand Instances, Reserved Instances, Spot Instances, etc. which we can choose as per our requirement. 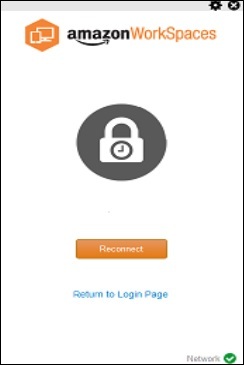 Step 1 − Sign-in to AWS account and open IAM console by using the following link https://console.aws.amazon.com/iam/. Step 2 − In the navigation Panel, create/view groups and follow the instructions. Step 3 − Create IAM user. Choose users in the navigation pane. Then create new users and add users to the groups. Step 4 − Create a Virtual Private Cloud using the following instructions. Select VPC from the navigation panel. Then select the same region in which we have created key-pair. Select start VPC wizard on VPC dashboard. Select VPC configuration page and make sure that VPC with single subnet is selected. The choose Select. VPC with a single public subnet page will open. Enter the VPC name in the name field and leave other configurations as default. Select create VPC, then select Ok. Step 5 − Create WebServerSG security groups and add rules using the following instructions. On the VPC console, select Security groups in the navigation panel. 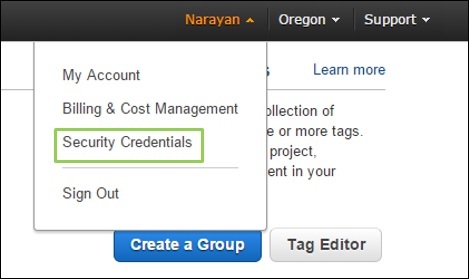 Select create security group and fill the required details like group name, name tag, etc. Select your VPC ID from the menu. Then select yes, create button. Now a group is created. Select the edit option in the inbound rules tab to create rules. 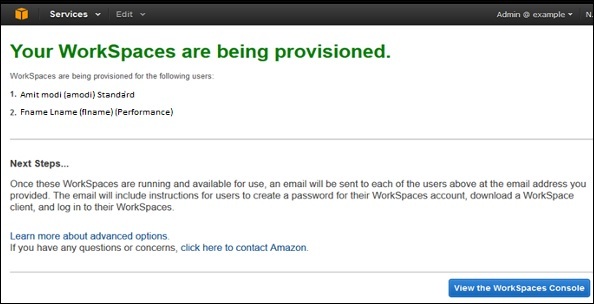 Step 6 − Launch EC2 instance into VPC using the following instructions. 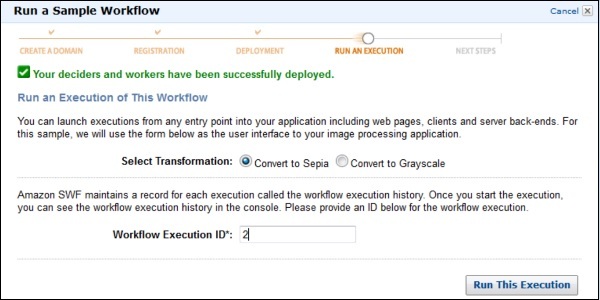 Select launch instance option in the dashboard. A new page will open. Choose Instance Type and provide the configuration. Then select Next: Configure Instance Details. A new page will open. Select VPC from the network list. Select subnet from the subnet list and leave the other settings as default. Click Next until the Tag Instances page appears. Step 7 − On the Tag Instances page, provide a tag with a name to the instances. Select Next: Configure Security Group. Step 8 − On the Configure Security Group page, choose the Select an existing security group option. Select the WebServerSG group that we created previously, and then choose Review and Launch. Step 9 − Check Instance details on Review Instance Launch page then click the Launch button. Step 10 − A pop up dialog box will open. Select an existing key pair or create a new key pair. Then select the acknowledgement check box and click the Launch Instances button. As the name suggests, auto scaling allows you to scale your Amazon EC2 instances up or down automatically as per the instructions set by the user. Parameters like minimum and maximum number of instances are set by the user. Using this, the number of Amazon EC2 instances you’re using increases automatically as the demand rises to maintain the performance, and decreases automatically as the demand decreases to minimize the cost. Auto Scaling is particularly effective for those applications that fluctuate on hourly, daily, or weekly usage. 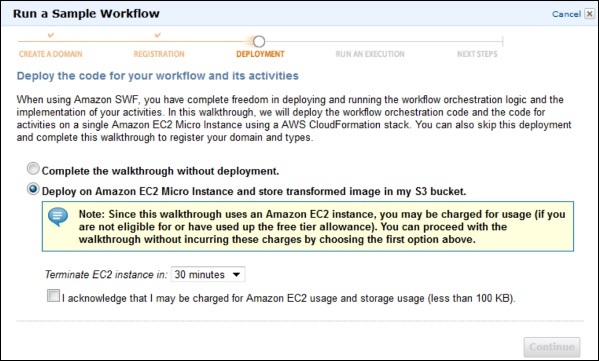 Auto Scaling is enabled by Amazon CloudWatch and is available at no extra cost. AWS CloudWatch can be used to measure CPU utilization, network traffic, etc. Elastic Load Balancing (ELB) automatically distributes incoming request traffic across multiple Amazon EC2 instances and results in achieving higher fault tolerance. It detects unfit instances and automatically reroutes traffic to fit instances until the unfit instances have been restored in a round-robin manner. However, if we need more complex routing algorithms, then choose other services like Amazon Route53. ELS is designed to handle unlimited requests per second with gradually increasing load pattern. It is not designed to handle sudden increase in requests like online exams, online trading, etc. How to Create Load Balancers? Step 1 − Go to Amazon EC2 console using this link − https://console.aws.amazon.com/ec2/. Step 3 − Select Load Balancers from the navigation pane and choose Create Load Balancer option. A pop-up window will open and we need to provide the required details. Step 5 − In create LB inside box: Select the same network which you have selected for instances. 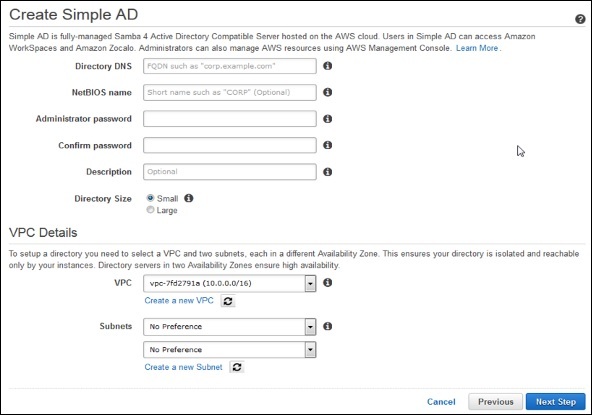 Step 6 − Select Enable advanced VPC configuration, if selected default VPC. Step 7 − Click the Add button and a new pop-up will appear to select subnets from the list of available subnets as shown in the following screenshot. Select only one subnet per availability zone. This window will not appear if we do not select Enable advanced VPC configuration. Step 8 − Choose Next; a pop-up window will open. After selecting a VPC as your network, assign security groups to Load Balancers. 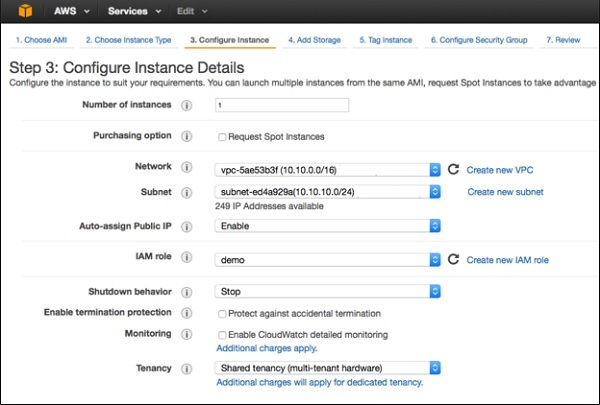 Step 9 − Follow the instructions to assign security groups to load balancers and click Next. Step 10 − A new pop-up will open having health checkup configuration details with default values. Values can be set on our own, however these are optional. 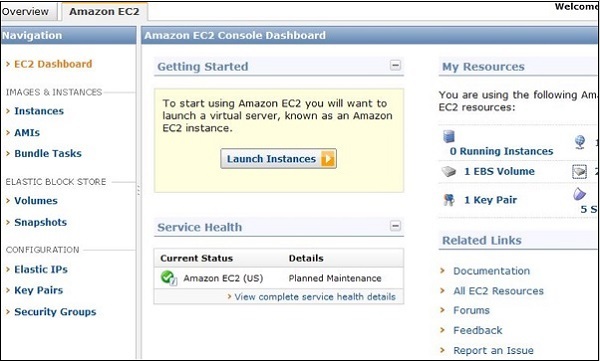 Click on Next: Add EC2 Instances. Step 11 − A pop-up window will open having information about instances like registered instances, add instances to load balancers by selecting ADD EC2 Instance option and fill the information required. Click Add Tags. Step 12 − Adding tags to your load balancer is optional. To add tags click the Add Tags Page and fill the details such as key, value to the tag. Then choose Create Tag option. Click Review and Create button. Step 13 − Click Create to create your load balancer and then click the Close button. How to Delete a Load Balancer? AWS Lambda is a responsive cloud service that inspects actions within the application and responds by deploying the user-defined codes, known as functions. It automatically manages the compute resources across multiple availability zones and scales them when new actions are triggered. AWS Lambda supports the code written in Java, Python and Node.js, and the service can launch processes in languages supported by Amazon Linux (includes Bash, Go & Ruby). Following are some recommended tips while using AWS Lambda. Write your Lambda function code in a stateless style. Never declare any function variable outside the scope of the handler. Make sure to have a set of +rx permissions on your files in the uploaded ZIP to ensure Lambda can execute code on your behalf. Delete old Lambda functions when no longer required. How to Configure AWS Lambda? 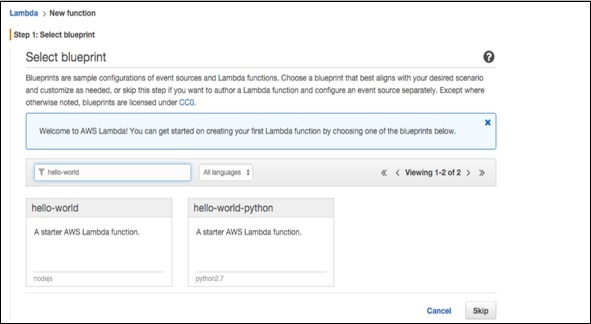 Follow these steps to configure AWS Lambda for the first time. 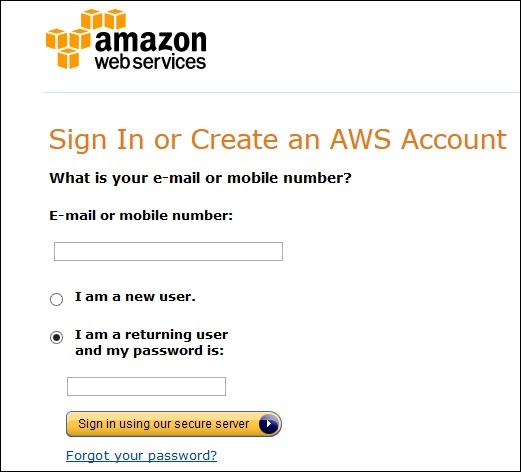 Step 1 − Sign in to AWS account. 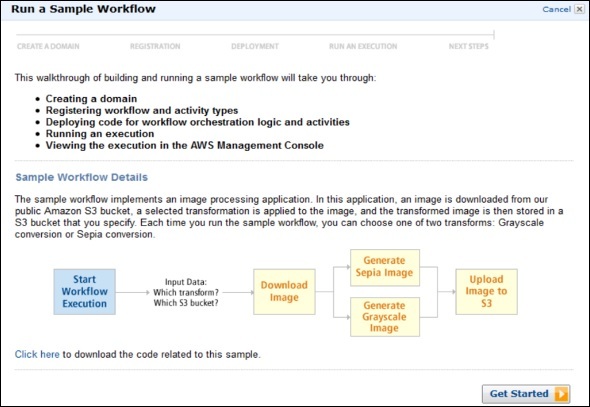 Step 2 − Select Lambda from AWS services section. Step 3 − Select a Blueprint (optional) and click the Skip button. 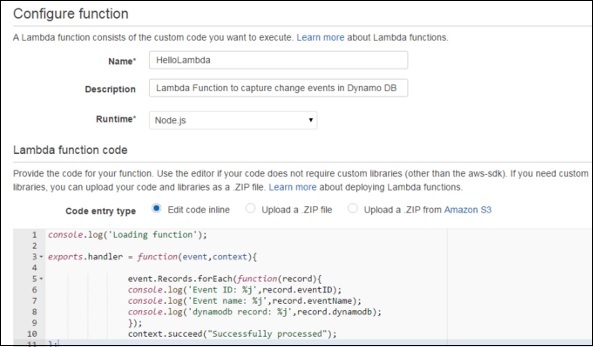 Step 4 − Provide the necessary details to create a Lambda function as shown in the following screenshot and paste the Node.js code that will be triggered automatically whenever a new item is added in DynamoDB. Select all the required permissions. Step 5 − Click the Next button and verify your details. Step 6 − Click the Create Function button. Now, when we select the Lambda service and select the Event Sources tab, there will be no records. Add at least one source to the Lambda function to work. Here, we are adding DynamoDB Table to it. We have created a table using DynamoDB (we will discuss this in detail in DynamoDB chapter). Step 7 − Select the stream tab and associate it with the Lambda function. You will see this entry in Event Sources Tab of Lambda Service page. Step 8 − Add some entries into the table. When the entry gets added and saved, then Lambda service should trigger the function. It can be verified using the Lambda logs. Step 9 − To view logs, select the Lambda service and click the Monitoring tab. Then click the View Logs in CloudWatch. Lambda tasks need not to be registered like Amazon SWF activity types. We can use any existing Lambda functions that you’ve already defined in workflows. 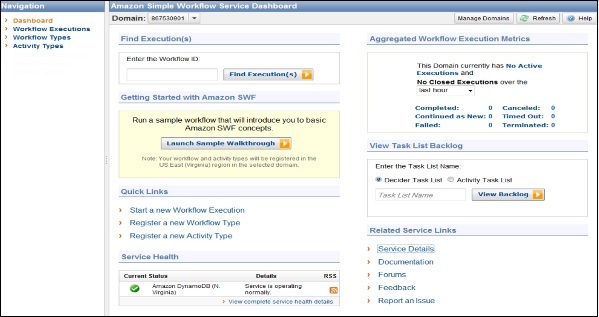 Lambda functions are called directly by Amazon SWF; there is no need design a program to implement and execute them. Lambda provides us the metrics and logs for tracking function executions. Following are the three types of Lambda limits. The throttle limit is 100 concurrent Lambda function executions per account and is applied to the total concurrent executions across all functions within a same region. The formula to calculate the number of concurrent executions for a function = (average duration of the function execution) X (number of requests or events processed by AWS Lambda). When throttle limit is reached, then it returns a throttling error having an error code 429. After 15-30 minute you can start work again. The throttle limit can be increased by contacting AWS support center. The following table shows the list of resources limits for a Lambda function. The following table shows the list of services limits for deploying a Lambda function. 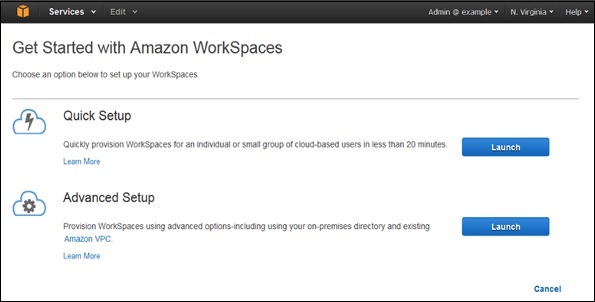 Amazon Virtual Private Cloud (VPC) allows the users to use AWS resources in a virtual network. The users can customize their virtual networking environment as they like, such as selecting own IP address range, creating subnets, and configuring route tables and network gateways. How to Use Amazon VPC? Following are the steps to create VPC. Step 2 − Select creating the VPC option on the right side of the navigation bar. Make sure that the same region is selected as for other services. Step 3 − Click the start VPC wizard option, then click VPC with single public subnet option on the left side. Step 4 − A configuration page will open. Fill in the details like VPC name, subnet name and leave the other fields as default. Click the Create VPC button. Step 5 − A dialog box will open, showing the work in progress. When it is completed, select the OK button. The Your VPCs page opens which shows a list of available VPCs. The setting of VPC can be changed here. Step 2 − Select the security groups option in the navigation bar, then choose create security group option. Step 3 − A form will open, enter the details like group name, name tag, etc. Select ID of your VPC from VPC menu, then select the Yes, create button. Step 4 − The list of groups opens. Select the group name from the list and set rules. Then click the Save button. Step 2 − Select the same region as while creating VPC and security group. Step 3 − Now select the Launch Instance option in the navigation bar. Step 4 − A page opens. Choose the AMI which is to be used. Step 5 − A new page opens. Choose an Instance Type and select the hardware configuration. Then select Next: Configure Instance Details. Step 6 − Select the recently created VPC from the Network list, and the subnet from the Subnet list. Leave the other settings as default and click Next till the Tag Instance page. Step 7 − On the Tag Instance page, tag the instance with the Name tag. This helps to identify your instance from the list of multiple instances. Click Next: Configure Security Group. Step 8 − On the Configure Security Group page, select the recently created group from the list. Then, select Review and Launch button. Step 9 − On the Review Instance Launch page, check your instance details, then select Launch. Step 10 − A dialog box appears. Choose the option Select an existing key pair or create a new key pair, then click the Launch Instances button. Step 11 − The confirmation page open which shows all the details related to instances. Step 2 − Select Elastic IP’s option in the navigation bar. Step 3 − Select Allocate New Address. Then select Yes, Allocate button. 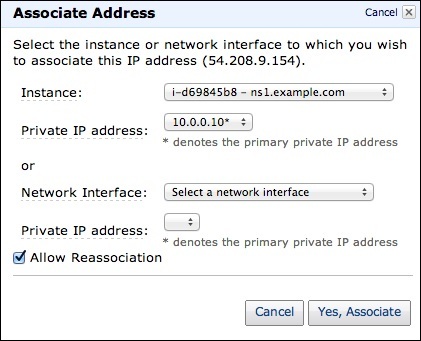 Step 4 − Select your Elastic IP address from the list, then select Actions, and then click the Associate Address button. Step 5 − A dialog box will open. First select the Instance from the Associate with list. Then select your instance from the Instance list. Finally click the Yes, Associate button. There are several steps to delete VPC without losing any resources associated with it. 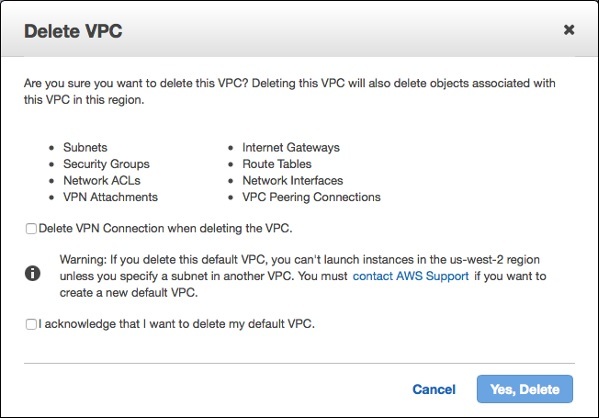 Following are the steps to delete a VPC. Step 2 − Select Instances option in the navigation bar. Step 3 − Select the Instance from the list, then select the Actions → Instance State → Terminate button. Step 4 − A new dialog box opens. Expand the Release attached Elastic IPs section, and select the checkbox next to the Elastic IP address. Click the Yes, Terminate button. Step 6 − Select the VPC from the navigation bar. Then select Actions & finally click the Delete VPC button. Step 7 − A confirmation message appears. Click the Yes, Delete button. 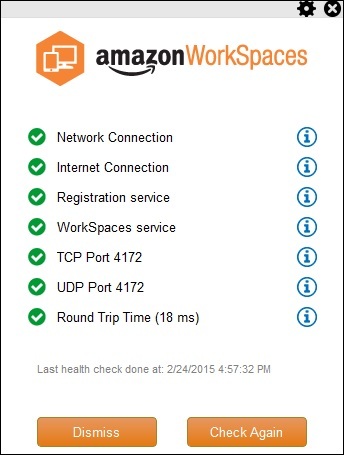 Many connectivity options − There are various connectivity options that exist in Amazon VPC. Connect VPC directly to the Internet via public subnets. Connect to the Internet using Network Address Translation via private subnets. Connect securely to your corporate datacenter via encrypted IPsec hardware VPN connection. Connect privately to other VPCs in which we can share resources across multiple virtual networks through AWS account. Connect to Amazon S3 without using an internet gateway and have good control over S3 buckets, its user requests, groups, etc. 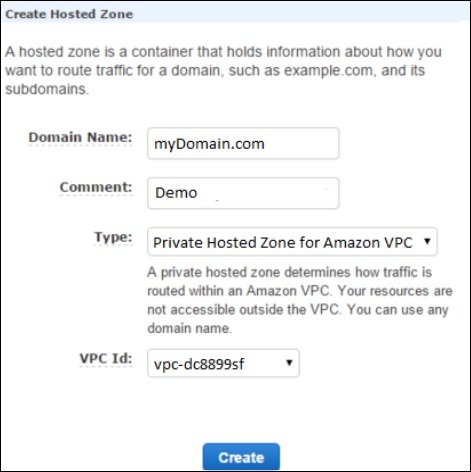 Combine connection of VPC and datacenter is possible by configuring Amazon VPC route tables to direct all traffic to its destination. Easy to use − Ease of creating a VPC in very simple steps by selecting network set-ups as per requirement. Click "Start VPC Wizard", then Subnets, IP ranges, route tables, and security groups will be automatically created. Easy to backup data − Periodically backup data from the datacenter into Amazon EC2 instances by using Amazon EBS volumes. Easy to extend network using Cloud − Move applications, launch additional web servers and increase storage capacity by connecting it to a VPC. AWS Direct Connect permits to create a private network connection from our network to AWS location. It uses 802.1q VLANs, which can be partitioned into multiple virtual interfaces to access public resources using the same connection. This results in reduced network cost and increased bandwidth. Virtual interfaces can be reconfigured at any time as per the requirement. Our network should be in the AWS Direct Connect location. 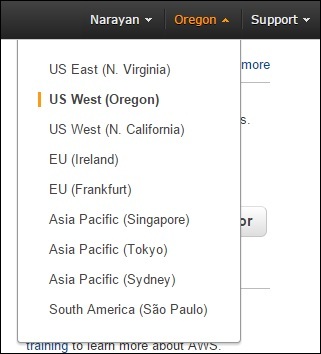 Visit this link to know about the available AWS Direct Connect locations https://aws.amazon.com/directconnect/. Our service provider must be portable to connect to AWS Direct Connect. Connections to AWS Direct Connect requires single mode fiber, 1000BASE-LX (1310nm) for 1 gigabit Ethernet, or 10GBASE-LR (1310nm) for 10 gigabit Ethernet. Auto Negotiation for the port must be disabled. Support for 802.1Q VLANs across these connections should be available. Network must support Border Gateway Protocol (BGP) and BGP MD5 authentication. Optionally, we may configure Bidirectional Forwarding Detection (BFD). How to Configure AWS Direct Connect? 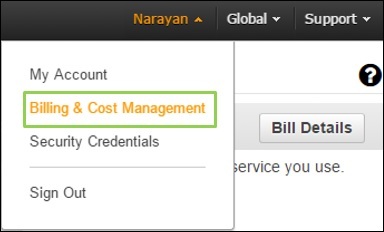 step 2 − Select AWS Direct Connect region from the navigation bar. 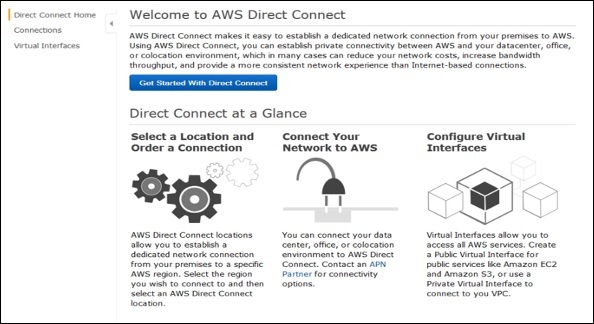 step 3 − Welcome page of AWS Direct Connect opens. Select Get Started with Direct Connect. step 4 − Create a Connection dialog box opens up. Fill the required details and click the Create button. AWS will send an confirmation email within 72 hours to the authorized user. Step 5 − Create a Virtual Interface using the following steps. Open AWS console page again. Select Connection in the navigation bar, then select Create Virtual Interface. Fill the required details and click the Continue button. Select Download Router Configuration, then click the Download button. Verify the Virtual Interface (optional). To verify the AWS Direct Connect connections use the following procedures. To verify virtual interface connection to the AWS cloud − Run traceroute and verify that the AWS Direct Connect identifier is in the network trace. 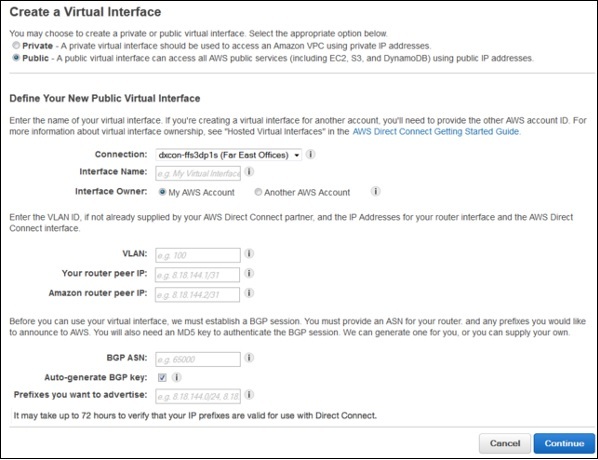 To verify virtual interface connection to Amazon VPC − Use any pingable AMI and launch Amazon EC2 instance into the VPC that is attached to the virtual private gateway. When an instance is running, get its private IP address and ping the IP address to get a response. Reduces bandwidth costs − The cost gets reduced in both ways, i.e. it transfers the data to and from AWS directly. The data transferred over your dedicated connection is charged at reduced AWS Direct Connect data transfer rate rather than Internet data transfer rates. Compatible with all AWS services − AWS Direct Connect is a network service, supports all the AWS services that are accessible over the Internet, like Amazon S3, Amazon EC2, Amazon VPC, etc. Private connectivity to Amazon VPC − AWS Direct Connect can be used to establish a private virtual interface from our home-network to Amazon VPC directly with high bandwidth. Elastic − AWS Direct Connect provides 1 Gbps and 10 Gbps connections, having provision to make multiple connections as per requirement. 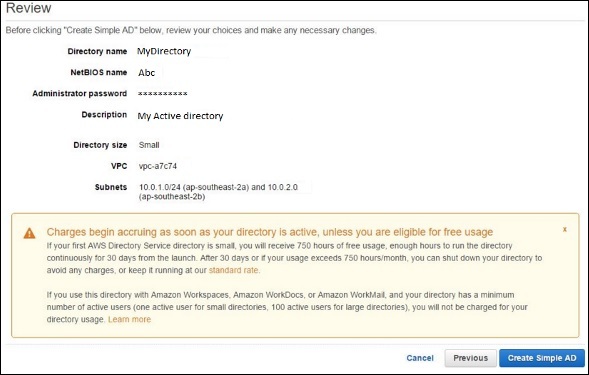 Easy and simple − Easy to sign up on AWS Direct Connect using the AWS Management Console. Using this console, all the connections and virtual interfaces can be managed. Amazon S3 (Simple Storage Service) is a scalable, high-speed, low-cost web-based service designed for online backup and archiving of data and application programs. It allows to upload, store, and download any type of files up to 5 GB in size. This service allows the subscribers to access the same systems that Amazon uses to run its own web sites. The subscriber has control over the accessibility of data, i.e. privately/publicly accessible. Following are the steps to configure a S3 account. Step 2 − Create a Bucket using the following steps. A prompt window will open. Click the Create Bucket button at the bottom of the page. Create a Bucket dialog box will open. Fill the required details and click the Create button. 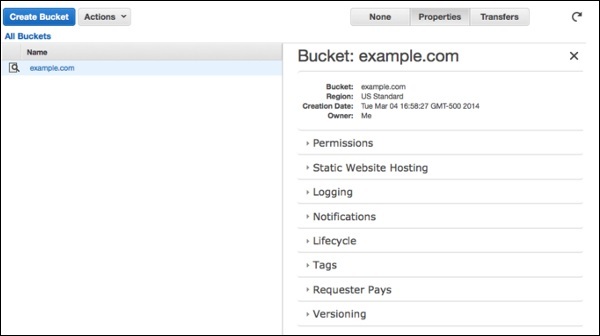 The bucket is created successfully in Amazon S3. The console displays the list of buckets and its properties. Select the Static Website Hosting option. Click the radio button Enable website hosting and fill the required details. Step 3 − Add an Object to a bucket using the following steps. Click the Add files option. Select those files which are to be uploaded from the system and then click the Open button. Click the start upload button. The files will get uploaded into the bucket. 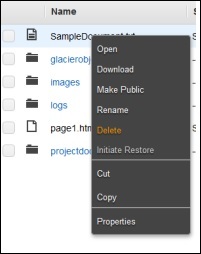 To open/download an object − In the Amazon S3 console, in the Objects & Folders list, right-click on the object to be opened/downloaded. Then, select the required object. How to Move S3 Objects? Following are the steps to move S3 objects. step 1 − Open Amazon S3 console. 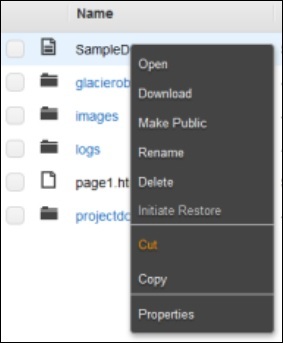 step 2 − Select the files & folders option in the panel. Right-click on the object that is to be moved and click the Cut option. step 3 − Open the location where we want this object. Right-click on the folder/bucket where the object is to be moved and click the Paste into option. How to Delete an Object? Step 1 − Open Amazon S3. Step 2 − Select the files & folders option in the panel. Right-click on the object that is to be deleted. Select the delete option. Step 3 − A pop-up window will open for confirmation. Click Ok.
How to Empty a Bucket? 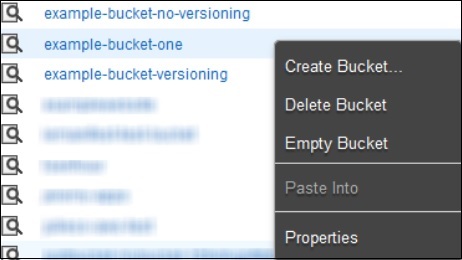 Step 2 − Right-click on the bucket that is to be emptied and click the empty bucket option. Step 3 − A confirmation message will appear on the pop-up window. Read it carefully and click the Empty bucket button to confirm. AWS Storage Gateway provides integration between the on-premises IT environment and the AWS storage infrastructure. The user can store data in the AWS cloud for scalable, data security features and cost-efficient storage. AWS Gateway offers two types of storage, i.e. volume based and tape based. This storage type provides cloud-backed storage volumes which can be mount as Internet Small Computer System Interface (iSCSI) devices from on-premises application servers. Every application requires storage volumes to store their data. This storage type is used to initially store data when it is to be written to the storage volumes in AWS. The data from the cache storage disk is waiting to be uploaded to Amazon S3 from the upload buffer. The cache storage disk keeps the most recently accessed data for low-latency access. 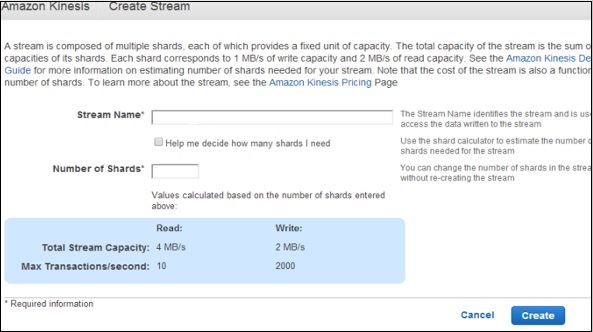 When the application needs data, the cache storage disk is first checked before checking Amazon S3. There are few guidelines to determine the amount of disk space to be allocated for cache storage. We should allocate at least 20% of the existing file store size as cache storage. It should be more than the upload buffer. Upload buffer disk − This type of storage disk is used to store the data before it is uploaded to Amazon S3 over SSL connection. The storage gateway uploads the data from the upload buffer over an SSL connection to AWS. Snapshots − Sometimes we need to back up storage volumes in Amazon S3. These backups are incremental and are known as snapshots. 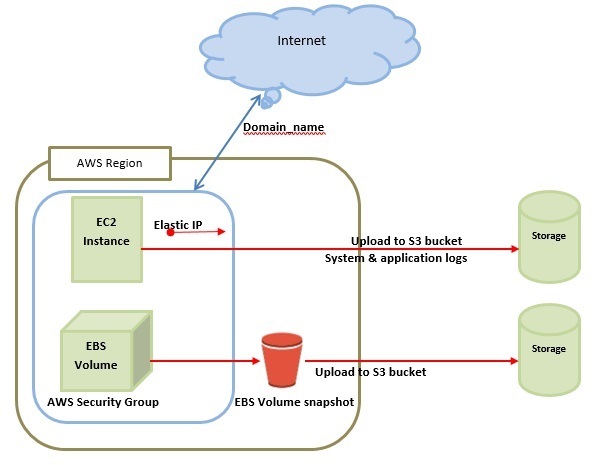 The snapshots are stored in Amazon S3 as Amazon EBS snapshots. Incremental backup means that a new snapshot is backing up only the data that has changed since the last snapshot. We can take snapshots either at a scheduled interval or as per the requirement. When the Virtual Machine (VM) is activated, gateway volumes are created and mapped to the on-premises direct-attached storage disks. Hence, when the applications write/read the data from the gateway storage volumes, it reads and writes the data from the mapped on-premises disk. A gateway-stored volume allows to store primary data locally and provides on-premises applications with low-latency access to entire datasets. We can mount them as iSCSI devices to the on-premises application servers. It ranges from 1 GB to 16 TB in size and supports up to 12 volumes per gateway with a maximum storage of 192 TB. This storage type provides a virtual tape infrastructure that scales seamlessly with your business needs and eliminates the operational burden of provisioning, scaling, and maintaining a physical tape infrastructure. Each gateway-VTL is preconfigured with media changer and tape drives, that are available with the existing client backup applications as iSCSI devices. Tape cartridges can be added later as required to archive the data. Few terms used in Architecture are explained below. Virtual Tape − Virtual tape is similar to a physical tape cartridge. It is stored in the AWS cloud. We can create virtual tapes in two ways: by using AWS Storage Gateway console or by using AWS Storage Gateway API. The size of each virtual tape is from 100 GB to 2.5 TB. The size of one gateway is up to 150 TB and can have maximum 1500 tapes at a time. Virtual Tape Library (VTL) − Each gateway-VTL comes with one VTL. VTL is similar to a physical tape library available on-premises with tape drives. The gateway first stores data locally, then asynchronously uploads it to virtual tapes of VTL. Tape Drive − A VTL tape drive is similar to a physical tape drive that can perform I/O operations on tape. Each VTL consists of 10 tape drives that are used for backup applications as iSCSI devices. Media Changer − A VTL media changer is similar to a robot that moves tapes around in a physical tape library's storage slots and tape drives. Each VTL comes with one media changer that is used for backup applications as iSCSI device. Virtual Tape Shelf (VTS) − A VTS is used to archive tapes from gateway VTL to VTS and vice-a-versa. Archiving Tapes − When the backup software ejects a tape, the gateway moves the tape to the VTS for storage. It is used data archiving and backups. 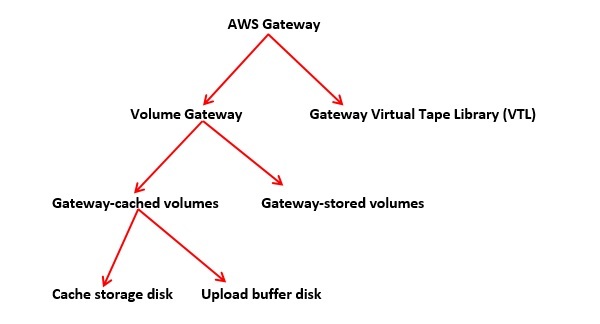 Retrieving Tapes − Tapes archived to the VTS cannot be read directly so to read an archived tape, we need to retrieve the tape from gateway VTL either by using the AWS Storage Gateway console or by using the AWS Storage Gateway API. CloudFront is a CDN (Content Delivery Network). It retrieves data from Amazon S3 bucket and distributes it to multiple datacenter locations. It delivers the data through a network of data centers called edge locations. The nearest edge location is routed when the user requests for data, resulting in lowest latency, low network traffic, fast access to data, etc. How AWS CloudFront Delivers the Content? AWS CloudFront delivers the content in the following steps. Step 1 − The user accesses a website and requests an object to download like an image file. Step 2 − DNS routes your request to the nearest CloudFront edge location to serve the user request. First CloudFront compares the request with the specifications and forwards it to the applicable origin server for the corresponding file type. As soon as the first byte arrives from the origin, CloudFront starts forwarding it to the user and adds the files to the cache in the edge location for the next time when someone again requests for the same file. CloudFront forwards the next request for the object to the user’s origin to check the edge location version is updated or not. If the edge location version is updated, then CloudFront delivers it to the user. If the edge location version is not updated, then origin sends the latest version to CloudFront. CloudFront delivers the object to the user and stores the latest version in the cache at that edge location. Fast − The broad network of edge locations and CloudFront caches copies of content close to the end users that results in lowering latency, high data transfer rates and low network traffic. All these make CloudFront fast. Simple − It is easy to use. Can be used with other AWS Services − Amazon CloudFront is designed in such a way that it can be easily integrated with other AWS services, like Amazon S3, Amazon EC2. Cost-effective − Using Amazon CloudFront, we pay only for the content that you deliver through the network, without any hidden charges and no up-front fees. Elastic − Using Amazon CloudFront, we need not worry about maintenance. The service automatically responds if any action is needed, in case the demand increases or decreases. Reliable − Amazon CloudFront is built on Amazon’s highly reliable infrastructure, i.e. its edge locations will automatically re-route the end users to the next nearest location, if required in some situations. Global − Amazon CloudFront uses a global network of edge locations located in most of the regions. How to Set Up AWS CloudFront? AWS CloudFront can be set up using the following steps. Step 3 − Create a CloudFront Web Distribution using the following steps. Click the Get Started button in the web section of Select a delivery method for your content page. Create Distribution page opens. 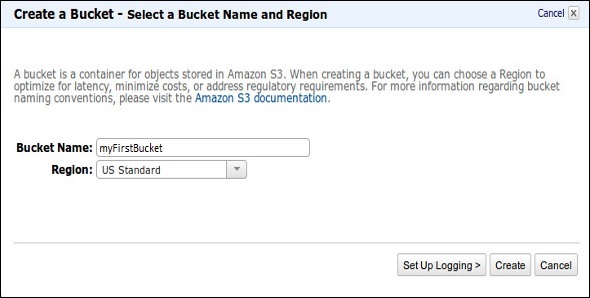 Choose the Amazon S3 bucket created in the Origin Domain Name and leave the remaining fields as default. Default Cache Behavior Settings page opens. Keep the values as default and move to the next page. A Distribution settings page opens. Fill the details as per your requirement and click the Create Distribution button. The Status column changes from In Progress to Deployed. Enable your distribution by selecting the Enable option. It will take around 15 minutes for the domain name to be available in the Distributions list. After creating distribution, CloudFront knows the location of Amazon S3 server and the user knows the domain name associated with the distribution. However, we can also create a link to Amazon S3 bucket content with that domain name and have CloudFront serve it. This helps save a lot of time. Step 1 − Copy the following HTML code to a new file and write the domain-name that CloudFront assigned to the distribution in the place of domain name. 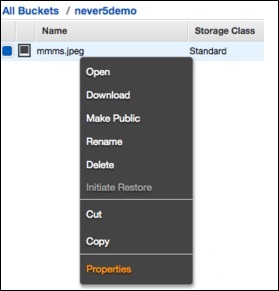 Write a file name of Amazon S3 bucket in the place of object-name. Step 2 − Save the text in a file with .html extension. Step 3 − Open the web page in a browser to test the links to see if they are working correctly. If not, then crosscheck the settings. Amazon RDS (Relational Database Service) is a fully-managed SQL database cloud service that allows to create and operate relational databases. Using RDS you can access your files and database anywhere in a cost-effective and highly scalable way. Scalable − Amazon RDS allows to scale the relational database by using AWS Management Console or RDS-specific API. We can increase or decrease your RDS requirements within minutes. Host replacement − Sometimes these situations occur when the hardware of Amazon RDS fails. There is no need to worry, it will be automatically replaced by Amazon. Inexpensive − Using Amazon RDS, we pay only for the resources we consume. There is no up-front and long-term commitment. Secure − Amazon RDS provides complete control over the network to access their database and their associated services. Automatic backups − Amazon RDS backs up everything in the database including transaction logs up to last five minutes and also manages automatic backup timings. Software patching − Automatically gets all the latest patches for the database software. We can also specify when the software should be patched using DB Engine Version Management. How to Set Up Amazon RDS? 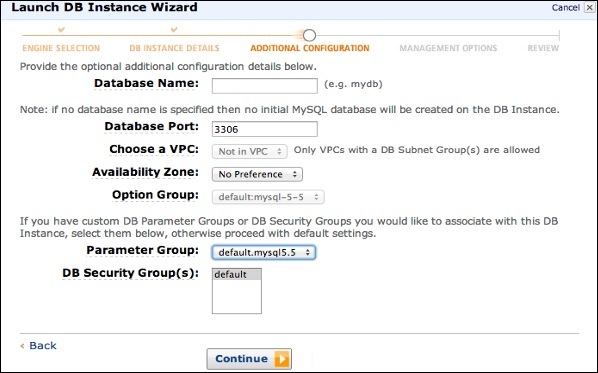 Step 2 − Select the region where the DB instance is to be created, at the top right corner of the Amazon RDS console. Step 3 − Select Instances in the navigation pane, then click Launch DB Instance button. 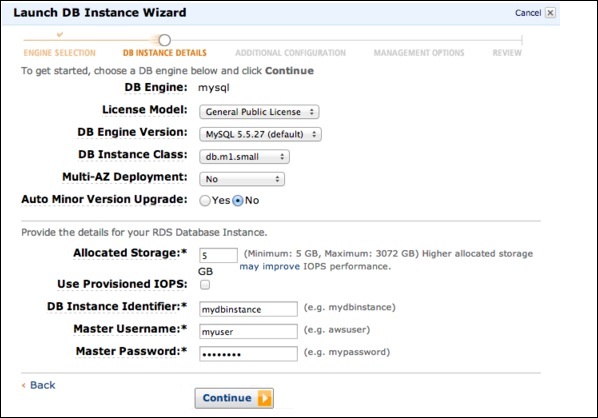 Step 4 − The Launch DB Instance Wizard opens. Select the type of instance as required to launch and click the Select button. Step 5 − On the Specify DB Details page, provide the required details and click the Continue button. 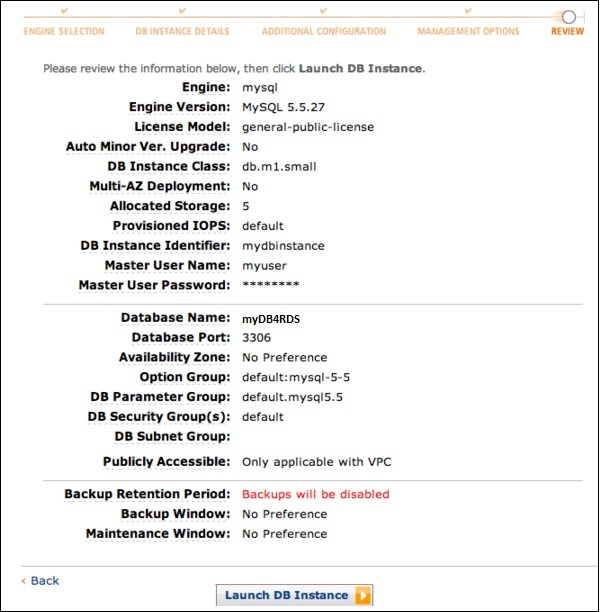 Step 6 − On the Additional configuration page, provide the additional information required to launch the MySQL DB instance and click the Continue button. Step 7 − On Management options page, make the choices and click the Continue button. Step 8 − On the Review page, verify the details and click the Launch DB Instance button. Now DB instance shows in the list of DB instances. How to Connect Database to MySQL DB Instance? Step 1 − Type the following command in the command prompt on a client computer to connect a database on MySQL DB instance (using the MySQL monitor). Step 2 − Replace <myDBI> with DNS name of your DB instance, <myusername> with your master user-name & <mypassword> with your master password. How to Delete a DB Instance? Step 1 − Sign in to the AWS Management Console and use the following link to open the Amazon RDS console. Step 2 − In the DB Instances list, select the DB instances to be deleted. 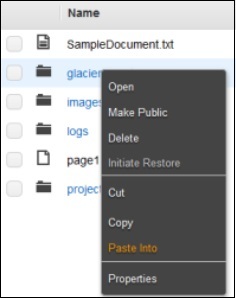 Step 3 − Click the Instance Actions button and then select the Delete option from the dropdown menu. Step 4 − Select No in the Create Final Snapshot. Step 5 − Click the Yes, Delete to delete the DB instance. Instance class − Pricing is based on the class of the DB instance consumed. Running time − Price is calculated by the instance-hour, which is equivalent to a single instance running per hour. Storage − Bill is calculated as per the storage capacity plan chosen in terms of per GB. I/O requests per month − Billing structure also includes total number of storage I/O requests made in a billing cycle. Backup storage − There is no additional charges for backup storage up to 100% of database. This service is free only for active DB instances. Amazon DynamoDB is a fully managed NoSQL database service that allows to create database tables that can store and retrieve any amount of data. It automatically manages the data traffic of tables over multiple servers and maintains performance. It also relieves the customers from the burden of operating and scaling a distributed database. Hence, hardware provisioning, setup, configuration, replication, software patching, cluster scaling, etc. is managed by Amazon. How to Run DynamoDB on Computer? Following are the steps to set up DynamoDB. Step 1 − Following are the steps to set up DynamoDB. Download DynamoDB (.jar file) using the following link. It supports multiple Operating Systems like Windows, Linux, Mac, etc. Once download is complete, extract the contents and copy the extracted directory to a location wherever you want. Step 2 − Create a Table using the following steps. 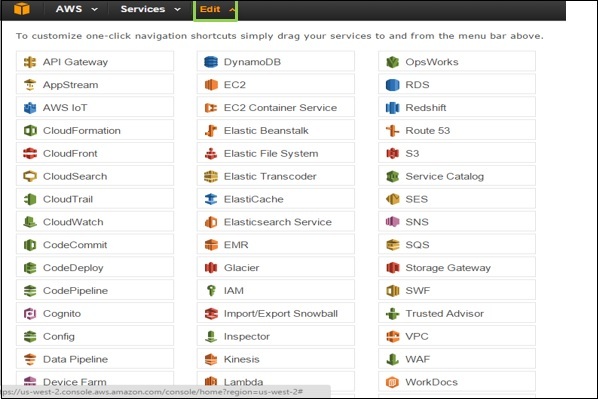 Open AWS Management Console and select DynamoDB. Select the region where the table will be created and click the Create Table button. Create Table window opens. Fill the details into their respective fields and click the Continue button. Finally, a review page opens where we can view details. Click the Create button. Now the Table-name is visible in the in-to the list and Dynamo Table is ready to use. Managed service − Amazon DynamoDB is a managed service. There is no need to hire experts to manage NoSQL installation. Developers need not worry about setting up, configuring a distributed database cluster, managing ongoing cluster operations, etc. It handles all the complexities of scaling, partitions and re-partitions data over more machine resources to meet I/O performance requirements. Scalable − Amazon DynamoDB is designed to scale. There is no need to worry about predefined limits to the amount of data each table can store. Any amount of data can be stored and retrieved. DynamoDB will spread automatically with the amount of data stored as the table grows. Fast − Amazon DynamoDB provides high throughput at very low latency. As datasets grow, latencies remain stable due to the distributed nature of DynamoDB's data placement and request routing algorithms. Durable and highly available − Amazon DynamoDB replicates data over at least 3 different data centers’ results. The system operates and serves data even under various failure conditions. Flexible: Amazon DynamoDB allows creation of dynamic tables, i.e. 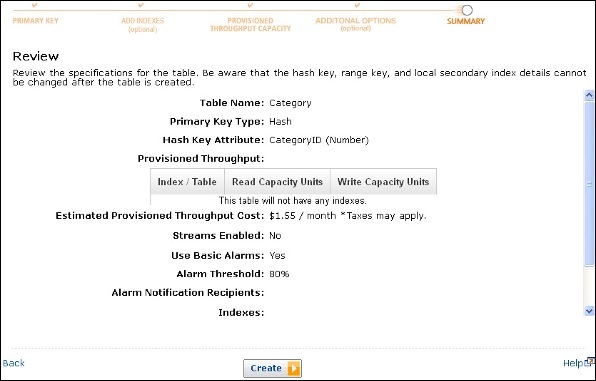 the table can have any number of attributes, including multi-valued attributes. Cost-effective: Payment is for what we use without any minimum charges. Its pricing structure is simple and easy to calculate. Amazon Redshift is a fully managed data warehouse service in the cloud. Its datasets range from 100s of gigabytes to a petabyte. The initial process to create a data warehouse is to launch a set of compute resources called nodes, which are organized into groups called cluster. After that you can process your queries. How to Set Up Amazon Redshift? 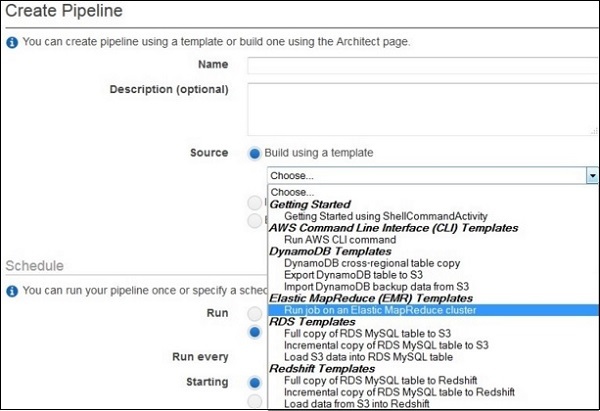 Following are the steps to set up Amazon Redshift. Step 1 − Sign in and launch a Redshift Cluster using the following steps. Select the region where the cluster is to be created using the Region menu on the top right side corner of the screen. Click the Launch Cluster button. The Cluster Details page opens. Provide the required details and click the Continue button till the review page. A confirmation page opens. Click the Close button to finish so that cluster is visible in the Clusters list. 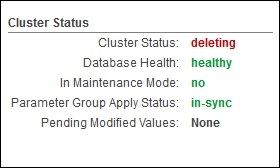 Select the cluster in the list and review the Cluster Status information. The page will show Cluster status. Step 2 − Configure security group to authorize client connections to the cluster. The authorizing access to Redshift depends on whether the client authorizes an EC2 instance or not. Follow these steps to security group on EC2-VPC platform. 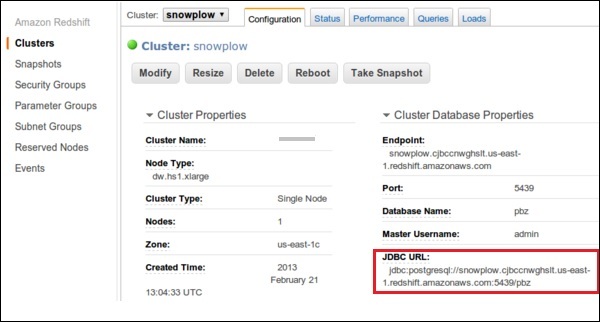 Open Amazon Redshift Console and click Clusters on the navigation pane. Select the desired Cluster. Its Configuration tab opens. Once the Security group page opens, click the Inbound tab. Click the Edit button. Set the fields as shown below and click the Save button. Type − Custom TCP Rule. Port Range − Type the same port number used while launching the cluster. By-default port for Amazon Redshift is 5439. Source − Select Custom IP, then type 0.0.0.0/0. Step 3 − Connect to Redshift Cluster. There are two ways to connect to Redshift Cluster − Directly or via SSL. Following are the steps to connect directly. Connect the cluster by using a SQL client tool. It supports SQL client tools that are compatible with PostgreSQL JDBC or ODBC drivers. Use the following steps to get the Connection String. 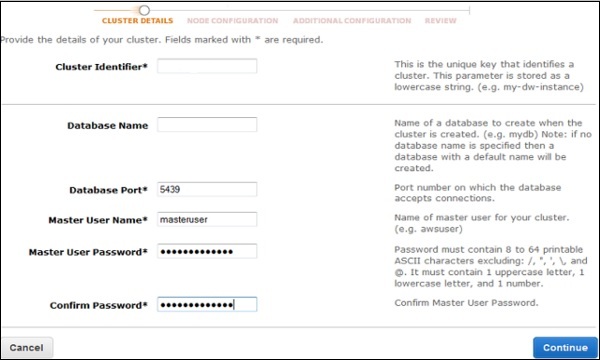 Open Amazon Redshift Console and select Cluster in the Navigation pane. Select the cluster of choice and click the Configuration tab. 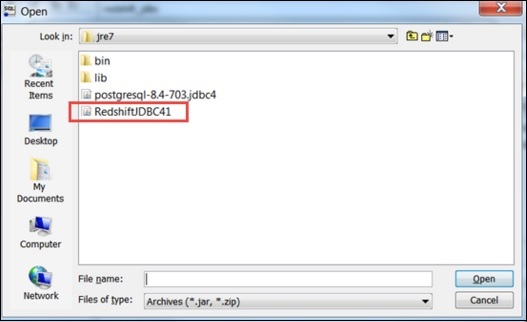 A page opens as shown in the following screenshot with JDBC URL under Cluster Database Properties. Copy the URL. Use the following steps to connect the Cluster with SQL Workbench/J. Select the File and click the Connect window. Select Create a new connection profile and fill the required details like name, etc. 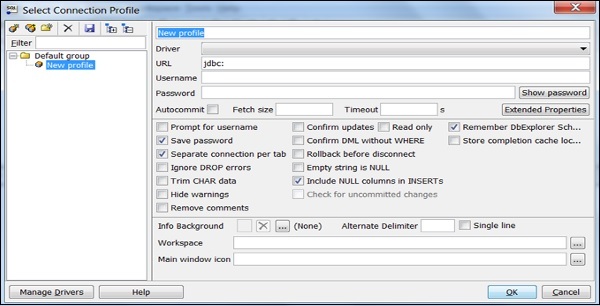 Click Manage Drivers and Manage Drivers dialog box opens. Click the Create a new entry button and fill the required details. Click the folder icon and navigate to the driver location. Finally, click the Open button. Leave the Classname box and Sample URL box blank. Click OK. Choose the Driver from the list. In the URL field, paste the JDBC URL copied. Enter the username and password to their respective fields. Select the Autocommit box and click Save profile list. Supports VPC − The users can launch Redshift within VPC and control access to the cluster through the virtual networking environment. Encryption − Data stored in Redshift can be encrypted and configured while creating tables in Redshift. SSL − SSL encryption is used to encrypt connections between clients and Redshift. Scalable − With a few simple clicks, the number of nodes can be easily scaled in your Redshift data warehouse as per requirement. It also allows to scale over storage capacity without any loss in performance. Cost-effective − Amazon Redshift is a cost-effective alternative to traditional data warehousing practices. There are no up-front costs, no long-term commitments and on-demand pricing structure. Amazon Machine Learning is a service that allows to develop predictive applications by using algorithms, mathematical models based on the user’s data. 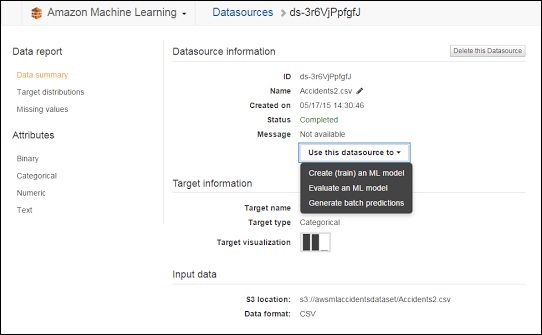 Amazon Machine Learning reads data through Amazon S3, Redshift and RDS, then visualizes the data through the AWS Management Console and the Amazon Machine Learning API. This data can be imported or exported to other AWS services via S3 buckets. It uses “industry-standard logistic regression” algorithm to generate models. A binary classification model can predict one of the two possible results, i.e. either yes or no. A multi-class classification model can predict multiple conditions. For example, it can track a customer's online orders. A regression model results in an exact value. Regression models can predict the best-selling price for a product or the number of units that will sell. 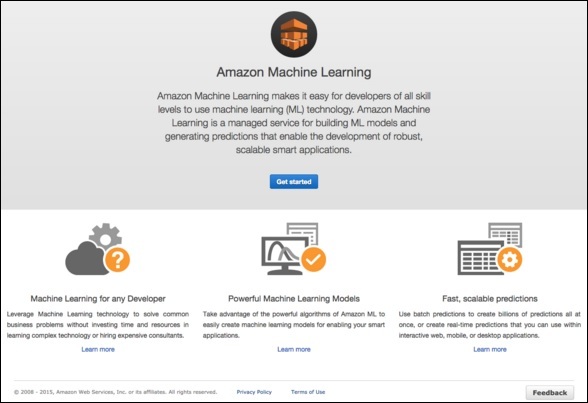 Step 1 − Sign in to AWS account and select Machine Learning. Click the Get Started button. Step 2 − Select Standard Setup and then click Launch. Step 3 − In the Input data section, fill the required details and select the choice for data storage, either S3 or Redshift. Click the Verify button. Step 4 − After S3 location verification is completed, Schema section opens. Fill the fields as per requirement and proceed to the next step. Step 5 − In Target section, reselect the variables selected in Schema section and proceed to the next step. Step 6 − Leave the values as default in Row ID section and proceed to the Review section. Verify the details and click the Continue button. Following are some screenshots of Machine Learning services. 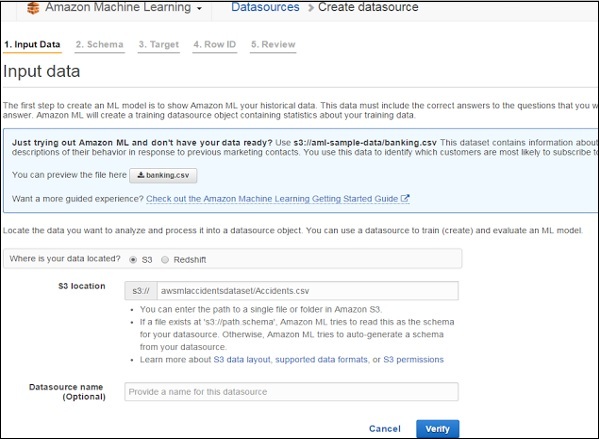 Easy to create machine learning models − It is easy to create ML models from data stored in Amazon S3, Amazon Redshift, Amazon RDS and query these models for predictions by using Amazon ML APIs and wizards. 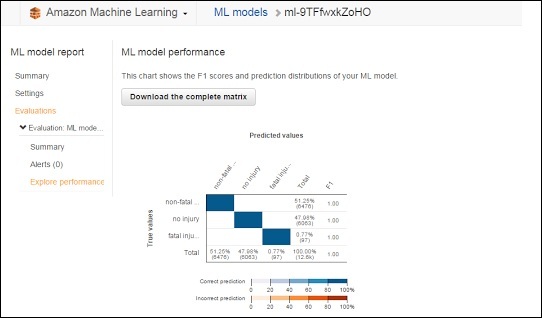 High performance − Amazon ML prediction APIs can be used further to generate billions of predictions for the applications. We can use them within interactive web, mobile, or desktop applications. Cost-efficient − Pay only for what we use without any setup charges and no upfront commitments. Amazon WorkMail was formerly known as Zocalo. It is a managed email and calendaring service that runs in Cloud. It provides security controls and is designed to work with your existing PC and Mac-based Outlook clients including the prepackaged Click-to-Run versions. It also works with mobile clients that speak the Exchange ActiveSync protocol. Its migration tool allows to move mailboxes from on-premises email servers to the service, and works with any device that supports the Microsoft Exchange ActiveSync protocol, such as Apple’s iPad and iPhone, Google Android, and Windows Phone. How to Use Amazon WorkMail? Step 2 − Click the Get Started button. Step 3 − Select the desired option and choose the Region from the top right side of the navigation bar. 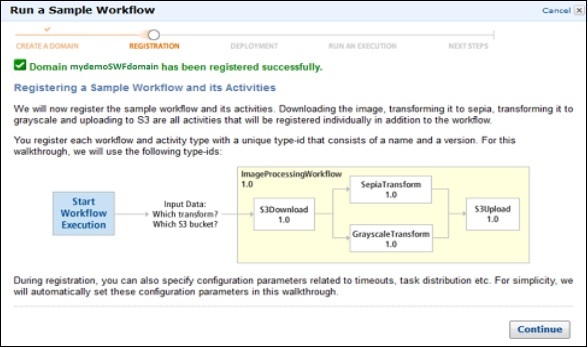 Step 4 − Fill the required details and proceed to the next step to configure an account. Follow the instructions. Finally, the mailbox will look like as shown in the following screenshot. 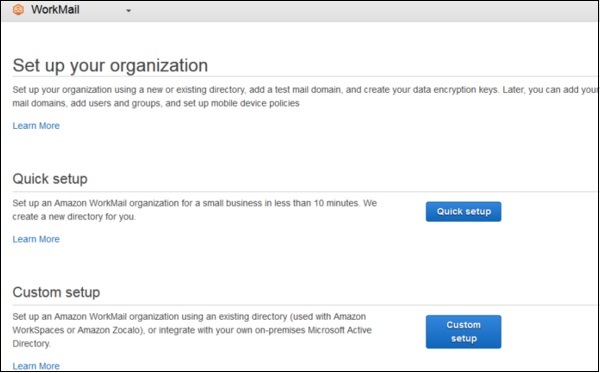 Secure − Amazon WorkMail automatically encrypts entire data with the encryption keys using the AWS Key Management Service. Managed − Amazon WorkMail offers complete control over email and there is no need to worry about installing a software, maintaining and managing hardware. Amazon WorkMail automatically handles all these needs. Accessibility − Amazon WorkMail supports Microsoft Outlook on both Windows and Mac OS X. Hence, users can use the existing email client without any additional requirements. Availability − Users can synchronize emails, contacts and calendars with iOS, Android, Windows Phone, etc. using the Microsoft Exchange ActiveSync protocol anywhere. 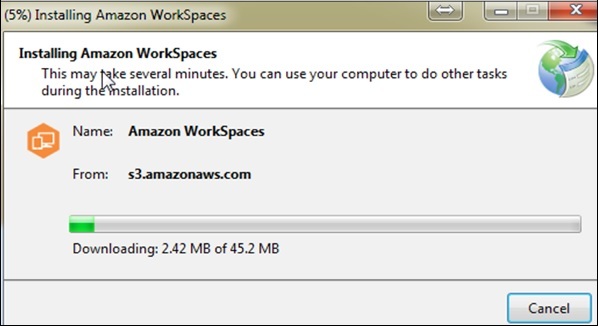 Cost-efficient − Amazon WorkMail charges 4$ per user per month up to 50GB of storage.